NASA is actively soliciting proposals for developing and validating active electrostatic radiation shielding to be used for protecting astronauts and space habitats in long duration human space missions. 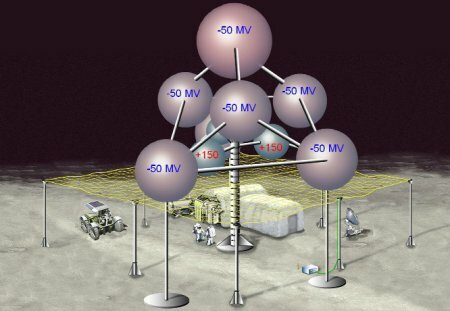 The idea of using an electrostatic radiation shield has been around since at least the 1950's; an artist's conception of an electrostatic shield created from inflatable, conductive spheres about 5 meters across for a lunar base is shown below. Rejecting passive shielding as too costly due to weight, NASA is looking carefully at active shielding this time. Primary candidates for active shielding include but are not limited to: confined and unconfined magnetic fields requiring super-conducting magnets, plasma shields, and electrostatic shields. Recently, a journal publication (Adv. Space Res. 42 (2008) 1043) made a critical analysis and demonstrated why previous approaches of using electrostatic and magnetic radiation shielding were not feasible. Further it clearly established the feasibility proof-of-concept of electrostatic active shielding using the novel approach of quadruple configuration. The biggest advantage of active electrostatic radiation shielding is that by preventing ions from hitting the spacecraft, the unknown harmful biological effects of continuous long duration exposure to space radiation is significantly reduced (~ 70 %) for galactic cosmic rays (GCR) and for solar particle events (SPE), of great concern for radiation exposure, it is practically eliminated. It is believed that the best strategy for radiation protection and shielding for long duration human missions is to use electrostatic active radiation shielding while, in concert, taking the full advantage of the state-of-the-art evolutionary passive (material) shielding technologies for the much reduced and weaken radiation that may escape and hit the spacecraft. SF fans have been treated to a variety of ideas relating to both active and passive shields on space craft. See the shield from Doc Smith's 1930 novel Skylark Three, the radiation shield from John W. Campbell's 1936 novel The Ultimate Weapon and the Langston Field from Niven and Pournelle's 1974 novel The Mote in God's Eye.